The Shoe Guest House is situated in Ohrigstad, known as the gateway to the Panorama Route and nestled at the foothills of the Drakensberg Mountains, close to the Blyde River Canyon, God&apos;s Window and Potholes. <br /><br />The Shoe Guest House offers accommodation in four stone-built chalets, each fully equipped for self-catering. 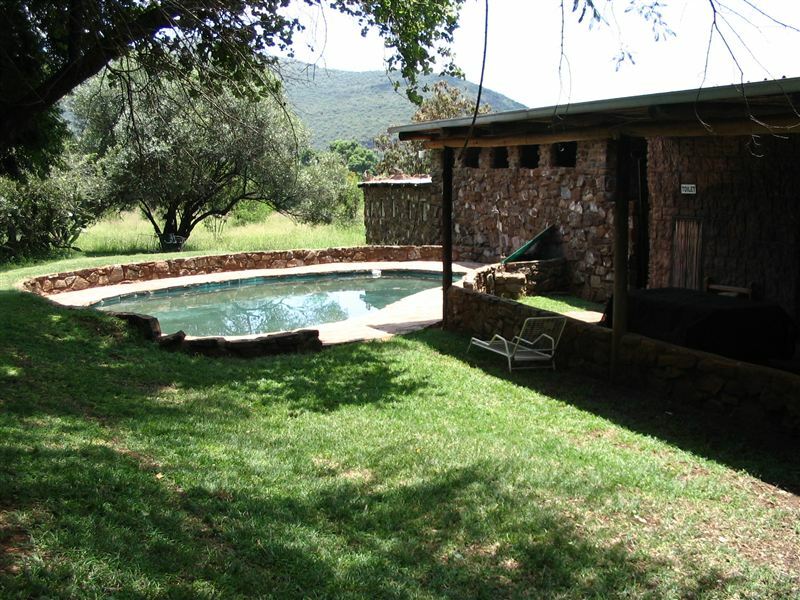 The chalets are located on a quiet farm land close to all the scenic sites of Graskop, Pilgrims Rest and the Kruger National Park, and features include a private braai area, swimming pool and an entertainment area.<br /><br />The Echo Caves was discovered in the 1920s and is a mesmerizing ecological site of the area. The caves have been declared a historical monument as there are some of the oldest caves in the world. The natural scenery and a moderate climate contribute to this tranquil and peaceful environment. "Friendly staff, clean room and had everything we needed. Great stay!" "The stone chalet was original and different. It was clean, but the beds and bedding are horrible. Duvet smelled of previous guests. That was unacceptable. The beds really old and uncomfortable. Very little investment in the place. Owners very nice and friendly. Pity so neglected." "Spent 2 nights there with my 3 young children, and we all enjoyed the place.Value for money is good, don&apos;t expect luxury for that price but a nice setting and the managers are friendly and helpful." "They offer great food at a low price. But the room itself was very disappointing. It wasn&apos;t clean, there was dirt on the floor and the bathroom and toilet did not look clean.We wouldn&apos;t recommend staying overnight.Establishments Response:Good day. You stayed in Number5. This unit was recently renovated, painted and the floor was re-laidwith stone from the mountain and polished. Our Chalets have a rustic lookfor we build it ourselves with stone from the mountain. Maybe it was justnot your idea of busveldt stay. In the future please bring such problemsdirectly to the owners attention, we could have moved you to a different roomif that one was not satisfactory to your needs. Why complain afterwards if youcould have done it straight away? Thank you for your constructive comments." "Very good. Will go their again. I will tell people about the lovely place." "Well I did not bother to stay there, we had some lunch which I must say was nice pitty the younger woman was put out of her way to do anything. Everything was a bother for her and she was not at all friendly or welcoming." "The management was very friendly and accommodating. The gardens were well kept. The braai meat we bought at the shop was fresh and tasty. The chalets had little natural light." "Accommodation and facilities are basic and clean. Staff and hosts are friendly and you feel welcome from the minute you arrive.Great stay and thank you for the "braai" on Saturday evening - it felt like home." "For our family it was an experience. And a good one at that. This is not your Aventura resort but the kindness and the warmth of the owners is gratifying. We rested well, the place is neat and the spiritual experience was great. Real farm cooking and food. Kids loved the place."